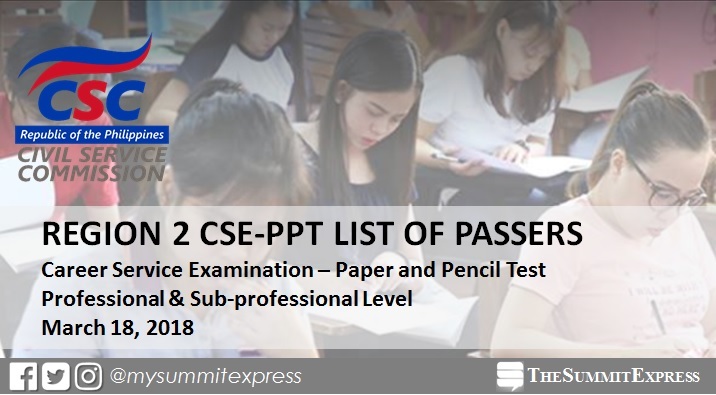 MANILA, Philippines – The Civil Service Commission(CSC) named on Wednesday, May 16, the successful examinees of March 2018 Civil Service Exam - Paper and Pencil Test (CSE-PPT) professional and sub-professional level for Region 2 (Cagayan Valley). CS passers who got at least 80 percent score will be eligible for the first and second level positions in the civil service provided the eligibles meet the qualifications and other requirements of the positions (education, experience, and training). Below is the full list of successful examinees for Region 2 professional and sub-professional levels. The three-hour test for the professional level includes vocabulary, grammar and correct usage, paragraph organization, reading comprehension, analogy, logic, and numerical reasoning (English and Filipino). For the latter, exam coverage is almost the same with the inclusion of clerical operations instead of analogy and logic and timed for 2.67 hours. Examinees can generate their examination rating through OCSERGS or Online Civil Service Examination Result Generation System which can also be accessed through the CSC website. Generation of examination rating through OCSERGS shall be available approximately 15 days after the posting of the List of Passers. Passers must personally claim their Certification of Eligibility (CoE). Representatives are not allowed to claim the same. Claiming of CoE shall be available approximately 30 days after the posting of the List of Passers or as indicated in the corresponding advisory of CSC.